Amazingly, a hunger for respect is more right on than I ever realized. At work, my husband receives kudos for a job well done. His paycheck and bonuses verify his skill and dedication. John also works hard to provide and protect his family. Respecting John is admiring his work, his character, and his care. It’s telling him I appreciate these things and admire him for the man he is. It’s not talking bad about him to my friends or even behind closed doors. It’s “talking him up” at home and in front of others and not second-guessing his ideas. It’s honoring his opinions and decisions (which is tough, especially when my opinion differs!). Of course God always knew what we’re just starting to understand. Check out Ephesians 5:33, “Each one of you also must love his wife as he loves himself, and the wife must respect her husband” (NIV). If we’re going to strive for “forever,” we need to think of the ways we can make this thing last. This is part of the work and the planning. 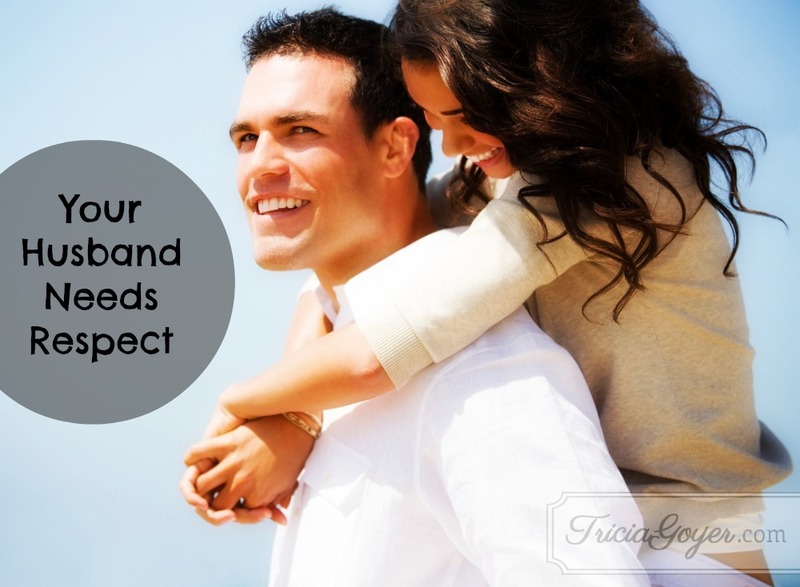 A good question to ask is: How can I show my husband the respect he desires? In an effort to show my respect, I try to remind John I believe in his capabilities, take time to understand his point-of-view, and affirm his accomplishments. John appreciates it when I stop what I’m doing to give him a pat on the back when he’s manicured the front lawn, cleaned the garage, or built a set of bookshelves. When I first started doing it I felt like a mom talking to a three-year-old, “Great job, honey.” But from his smile, I quickly learned that he was energized by my praise. The amazing thing is that when you do look for ways to show respect, and you do work at it, your needs are met, too. Because your husband is getting what he needs, he pours out his love in return. Emerson Eggerich, in his book Love and Respect, calls this the Energizing Cycle. “Her love motivates his respect. His respect motivates her love.” I can confess, being in this cycle is indeed energizing . . . and fun! Respect: -noun. Esteem for or a sense of the worth or excellence of a person, a personal quality or ability, or something considered as a manifestation of a personal quality or ability. Admiration: -noun. A feeling of wonder, pleasure or approval. What would a man give for a wife that respects and admires him? I’ve seen this lived out . . . his whole heart. How can you show your husband that you respect him? Looking for a Christmas present to give to a reader this holiday season? Why not give a copy of A Whisper of Freedom? What do You and Your Husband have in Common? I just wanted to say I just found your podcast and listened to your interview with Dr. Emerson Eggerichs. I found it interesting about the shoulder to shoulder time. I had heard that before. My husband and I have been going through a really difficult time and he had really pulled away from me. The last few weekends, he’s initiated and seemed to have wanted to spend a lot of time with me mostly watching tv or movies. I’ve been really encouraged by that. And even though we aren’t talking about issues, we are bonding and just having fun together. I really enjoyed that podcast and learned alot from it. Jeanne, that’s wonderful! It sounds like you’re on the right track! Keep your heart tender, and keep sitting by his side!